Leaving to Him the rest. I took this photo in Morocco over a year ago. There was the sound of rhythm happening in their work. The thrum of threads, the movement of the shuttle–a sacred sort of sound, all its own. In the dark corner of a towering and beautiful old building of a rug seller’s shop, magic was happening. I do not know the story of these girls. I do not know if they were paid enough for what their talent deserved. I do not know what kind of hardships awaited them at home, if any at all. But what I do know is that, out of emptiness, they were creating something beautiful in both color and sound. This prayer was given in honor of my grandpa from his union, the International Brotherhood of Electrical Workers. It was tied with ribbons in a leather case containing an exquisitely beautiful bible, its pages edged in gold. I clutched it tight in my arms, holding it for my grandma, as the pall bearers carried my grandpa’s casket and placed it in the hearse. I was trying to comprehend the reality at hand, while my mind fiercely, sharply relived the same ritual of Carl’s casket being carried away from me only weeks before. The tears that rolled down my cheeks were huge with pain, my brain and body and heart only able to carry the weight of one loss at a time. I share this photo in black and white because I have not yet made it to a place of color. I spend a large part of every day praying that the grand design of all this heartache will someday become known to me. And, if not the grand design, then at least some colorful sort of pattern that might light a fire in my belly once again. I traveled in Morocco as part of an personal and ongoing project of photographing and painting stray dogs. Or, at least, that was my intention. When I got there I found that there were very, very, very few stray dogs. In a difficult economic climate, that didn’t make much sense. Even so, I was hopeful in the idea that perhaps the Moroccans were simply taking good care of their dogs. Unfortunately, I quickly learned that the lack of the stray dog population was due to the fact that they were being round up and shot to death. The cats, however, were another matter. There were cats everywhere. Many of them were in horrible condition. Others, a little more lucky if they found a kindhearted store owner who might put out some milk, food scraps, or even a cardboard box for them. I found myself being pulled down a very unexpected path, deep into the labyrinths of the medinas where, instead of photographing stray dogs, I began to photograph the cats. They were everywhere, at every turn. I was emotionally and mentally unprepared for this change of plans and the heartache I would feel at the end of each day. Even so, to be a witness to such suffering made me feel more alive. My entire life, I have been drawn to these difficult places. The places where others turn their head. Who am I, holding a dying kitten, to think that I might have anything to offer a situation as desperate as this? Looking through photography files in search of this weaving image made me wish I had the ability to throw myself into travel once again. There are hundreds of more images, many of animals, haggard or in distress. But right now I realize that patience is required. I am in my own desperate place. 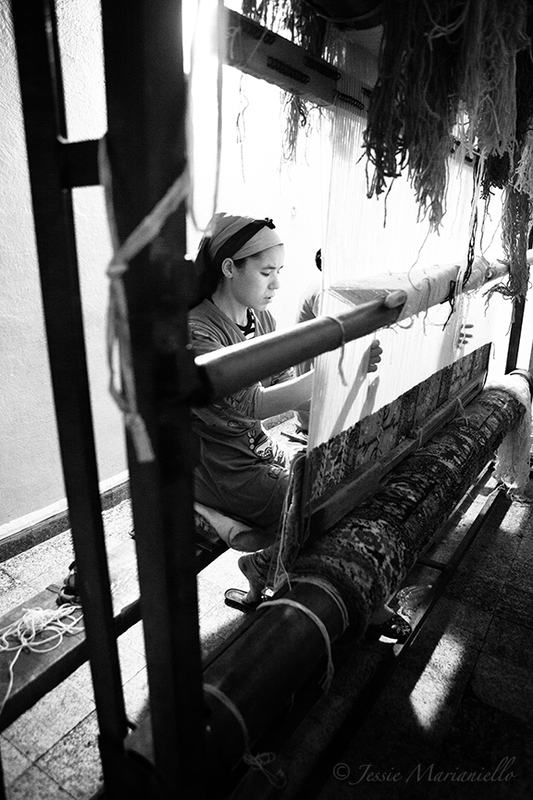 The weaving that is being done is made up of dark, knotted and confusing threads. I wonder, at times, why my healing path in losing Carl has been so slow and full of seeming failure. And yet…I trust that each time I knock up against pain and disappointment, fears and deep, deep sadness that God is asking for me to reach for Him. To trust Him. We all have a different path to walk, a different purpose. Perhaps my purpose will lead me places that will require a stronger foundation than others might require. But what I feel is that this time is sacred. As difficult as it is and as much as I want to untangle myself from it…something is being woven. And in all these dark days and difficult nights, THIS is the thing that gives me hope. I love you, Carl. I know with my whole heart that your life and death and my love for you is leading me someplace where most people don’t go. Posted on March 21, 2015 March 22, 2015 by jessiemarianiello	This entry was posted in faith, God, grief, travel and tagged faith, god, grief, photography, prayer, travel. Bookmark the permalink.